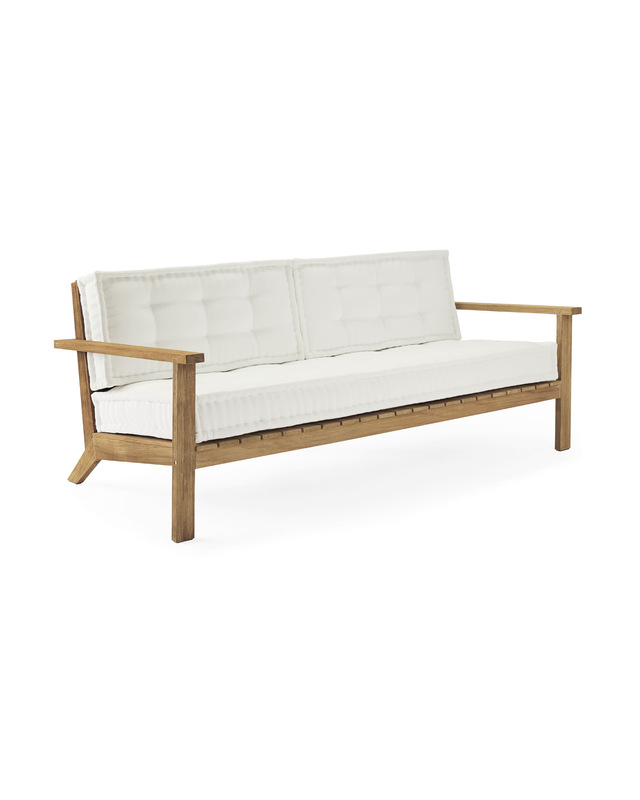 Cliffside Teak SofaCliffside Teak Sofa, alt="Cliffside Teak Sofa, "
Cushions: Stocked in White Sunbrella® Performance Canvas; ships within 2-4 weeks. All other cushions are made to order and ship within 4-6 weeks. Print Destined to become a classic, our streamlined silhouette is crafted from the finest sustainable teak that retains its beauty season after season. A deep, comfy seat slipcovered in all-weather fabric keeps things elevated. Extra design points: Teak’s distinguished silvery patina will develop over time, giving your furniture mellow grace and character. 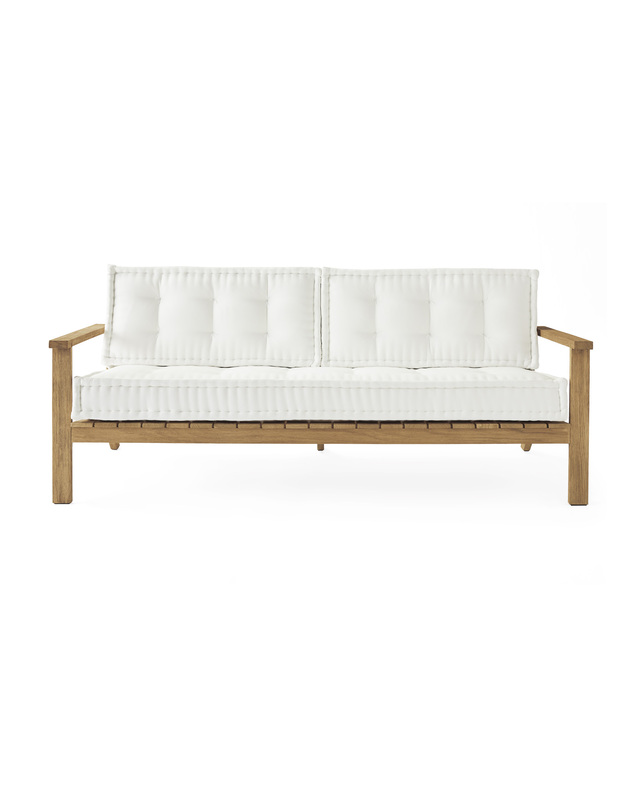 Crafted of weather-resistant, unfinished Grade A Teak. Apply teak oil 1-2 times per season to maintain the table's original finish. Store indoors when not in use. Cushions have an all-weather foam and polyester fill. All of our performance fabrics have been thoughtfully selected to provide indoor style and comfort outdoors. Sunbrella® Canvas cushions are tufted with self-piping, while Perennials® cushions feature a self-flange with no tufting. Perennials® Performance Fabrics are designed to resist UV radiation, mold, mildew, and staining. 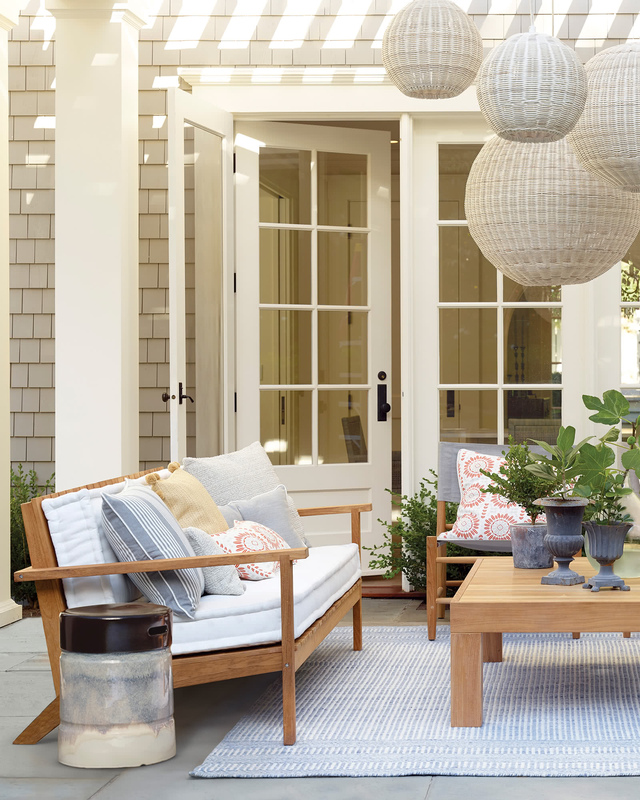 Sunbrella® all-weather slipcovers are designed to repel water, resist mildew and stand up to extreme sun, heat and rain exposure without fading. 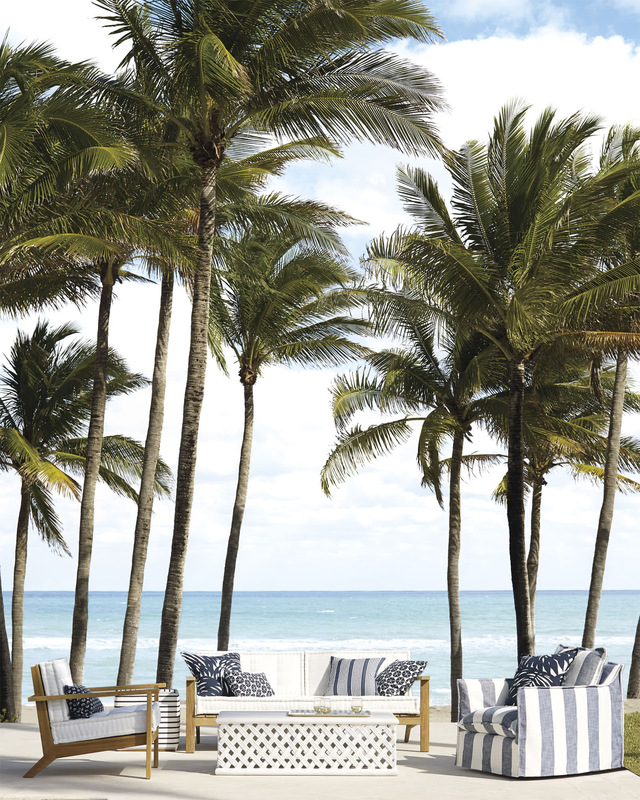 Our Performance Beach Stripe and Surf Stripe fabrics are designed to repel water and resist mildew, fading, and staining. Cushions have a mesh bottom lining to help keep moisture at bay. Velcro® tabs on seat cushions attach to the frame. To preserve your cushions season after season, don't leave them exposed to inclement conditions. Store indoors when not in use for an extended period of time. Overall: 77.5”W x 37.5”D x 30.5”H. Furniture frames and in-stock Sunbrella white cushions ship via White Glove delivery and arrive within 2-4 weeks of order receipt. Made to order cushions ship separately via Front Door Delivery and arrive within 4-6 weeks of order receipt. Our White Glove delivery service includes bringing the item into your home (up no more than two flights of stairs), unpacking it and removing all packaging. Headboards will be unpacked but not attached to existing bed frames. Our Front Door Delivery service includes carefully placing the item at your doorstep by our local delivery partners. Packing materials will not be removed. Return Policy: We stand behind the quality of our products. In the event that an item arrives defective or damaged, please let us know immediately upon receipt and we will make it right. Custom upholstery pieces are non-returnable; orders may be cancelled only within 24 hours of placement. If you have questions about shipping, delivery or returns, please call our Customer Care team at 866.597.2742 or email us atcustomercare@serenaandlily.com.